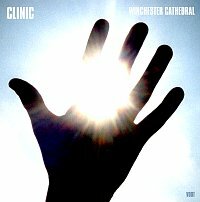 With the release of their third full-length, Winchester Cathedral, Liverpool-based quartet Clinic have upped the bar yet again with their trademark sound of odd-, eerie-indie-pop, post-punk excitement, and guitar-rock experimentation. 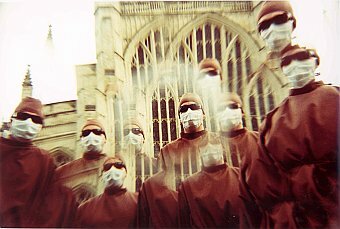 Whereas their second, and breakthrough album Walking With Thee was very polished and produced, Winchester Cathedral strips away the production to give a rawer, more organic record, something front man Ade Blackburn quickly brings up to me. "Walking With Thee is mood-based, it has a late-night feel to it. It is a lot more polished than the early singles and the first record," points out Blackburn. "So we didn't want to make a record that sounded polished. We wanted a more earthy sound to it, so we used upright acoustic pianos, whereas in the past we just used electronic pianos. We wanted it to sound like a band was in the next room playing for you." And Winchester Cathedral is that record. "The great thing about analog is that it gives an album edginess and still makes it warm," Blackburn tells me, discussing the recording of Winchester Cathedral. The band entered the studio with the basics and arrangements worked out, but while in the studio, the songs took on a life of their own, as they played around with sound effects to give the songs their own life. Adventure and exploration was one of the goals the band wanted to accomplish with this record. "The section of it that I feel is most adventurous is the majestic soul stuff," says Blackburn. "That is something we can say we are pushing ourselves in a different direction." "And the weirder folk stuff, too," he continues. "The main thing we didn't want to do, which I don't think we did, was be lazy about things and put things together by resting on our laurels." Blackburn pauses for a bit and then proudly declares, "If you give the record a proper listen, more than just once through, I think you will hear we accomplished what we were going for, to push our sound. "As time progresses, people want the unique sound you have created and something new, which gets harder to do album after album," Blackburn confesses. "So it's about finding that unique balance. And to find the unique balance we first made sure we're happy with it and enjoy what we're doing. That's the key." To achieve their goals, Blackburn informs me of the band philosophy: "What you have to do is have a completely idolized idea of what a record should sound like and keep pushing and working towards that." Though, as much as Winchester Cathedral has progressed the band's sound, Blackburn still stands firm in his assertion that he thinks Walking With Thee is the band's record that differs the most from their collection of singles and their debut, Internal Wrangler. "I think our most different record is Walking With Thee. As we tried new things it became more and more elaborate and more produced, and personally I prefer something more rural". Having recorded three full-lengths, and making their name off of being a singles band and releasing stunning singles every fun months, Blackburn says he still prefers recording and releasing singles over full-lengths. "I am more of a fan of singles because you can do two or three songs and get closer to your ideals of how you want the single to sound," he tells me. "Whereas with albums you have to sit down and play around with schedules like marketing, publicity, and working into the label's release schedule." It is those outside influences, such as labels and managers that Blackburn and Clinic try to avoid. He tells me he's learned a lot from making three records, including how to avoid outside pressures to please people. "If you get into that, because it will help your career, you get lost and it's hard to maintain the character of the music. That is why Clinic avoids all of that," he says without any hint of falsity. I ask Blackburn how Clinic keeps things fresh after three records and countless tours, to not have it turn into a job, and allow the outside pressures creep in. Blackburn tells me that, "With each new batch of songs, using different instrumentation, or implementing different styles than you've done before, that is key. And playing live, using different visuals and pictures as a backdrop, which we change for each album. That helps you keep things fresh". The band recently finished up their U.S. tour in support of Winchester Cathedral and is now playing gigs around Britain. They will be heading to Japan for the first time in three years in 2005, with another single and an EP planned for release in the spring. 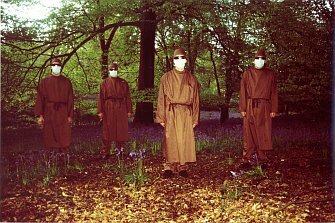 Look for Clinic to tour non-stop throughout 2005, whereas following Walking With Thee 's initial blast of touring, including the U.S., they disappeared for over a year without many gigs and little touring.